If have the following code. 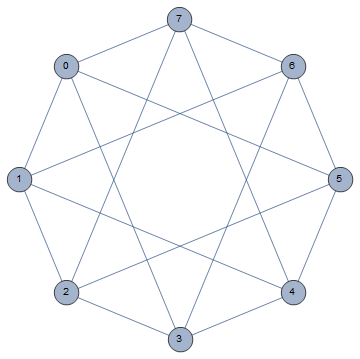 This generates a graph with 8 vertices. If the vertices are labeled 0, 1, ..., 7, where two vertices are adjacent whenever their difference is relatively prime to 8 (so 3 and 6 are adjacent since 6 - 3 = 3 is relatively prime to 8). I would like to have the graph drawn so that the vertices are in specific positions. Specifically, I would like to have the vertices 0, 1, ..., 7 evenly spaced around a circle in this order. In other words, this the graph should look like a regular octagon with additional edges inside. Is there a way to modify my code so that the vertices get drawn in this way? Not the answer you're looking for? Browse other questions tagged graphs-and-networks or ask your own question. How can I sequentially apply different graph embeddings?